Barnes & Noble has introduced a lower-priced Nook Tablet in addition to decreasing the asking price for existing Nook Color units. The budget-friendly Nook Tablet now rivals the price of Amazon’s Kindle Fire at $199 while the Color has dropped to $169. The newly-announced Nook Tablet is nearly identical to the existing model except that it features half the storage at 8GB and 50 percent less RAM at only 512MB. Storage isn’t a big deal as the device features a microSD card slot but cutting the system RAM in half will likely have a noticeable impact on the performance of the tablet. 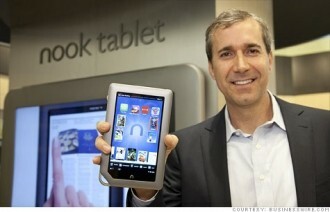 The company announced the original Nook Tablet in November 2011. At $249 with twice as much storage and memory as the Fire, Barnes & Noble hoped that potential buyers would pony up the extra money for the premium features. Instead it has been Amazon’s tablet that’s gained the largest market share, second only to Apple’s dominate iPad. Barnes & Noble also announced that the Nook Color e-reader is now $30 cheaper at $169. Originally released in October 2010, the Color features a 7-inch display, 8GB of internal storage and 512MB of RAM – all similar to the new Nook Tablet, although it has a slower 800MHz ARM processor. Both products are available starting today online with in-store availability in the coming weeks.